Art and Quilting in Camden and Hope » Blog Archive » Lost Quilts—if anyone sees them…. 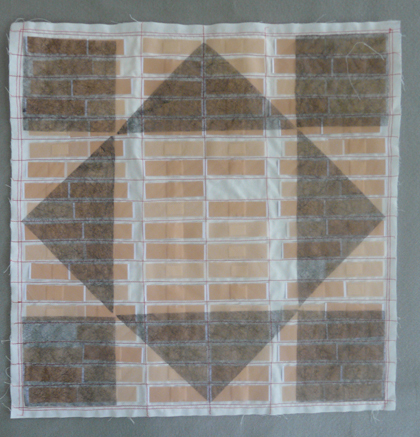 Lost Quilts—if anyone sees them…. PLEASE send our quilts home! 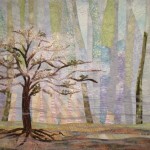 This past summer, Anne Copeland of the Fiberarts Connection curated the exhibit “Then and Now” that was on display at the Mancuso shows in New Hampshire (World Quilt Competition) and California (Pacific International Quilt Festival, PIQF, Santa Clara). The Mancuso show folks returned all the quilts to Annie, who in turn packed them up to return to their owners. All but four have made it home; alas, it appears that two of my quilts and two of Wendy L. Starn’s quilts are currently lost and unaccounted for since about October 11th, over a month. 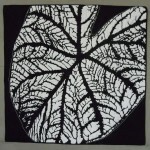 If you see these quilts for sale anywhere (or anywhere or any way else!) PLEASE let me know!!!!!!! As far as we can figure, Annie shipped out most of the boxes on October 11th at an Office Depot near her home in Lomita, California; they are a postal acceptance facility. Those quilts were packed in Flat-Rate Medium USPS (US Postal Service) boxes; all of those for which she has a receipt and tracking numbers were delivered. Several days later Annie made two trips to the US Post Office in Lomita. One trip was for the international shipments (to Canada and the Netherlands) and another was for domestic mail. Annie had tracking numbers for six of seven boxes known to ship that day, and all are marked as delivered according to the USPS Tracking and the seventh box the recipient has said she received her quilts. Of those who answered my e-mail, everyone had opened their boxes and received only their own quilts (and with the size of the box it would be pretty hard to fit in extras). That leaves the four quilts–shown above in small images and below full size–missing: “Fields of Gold” and “Dogwood::Dawn” made by me, and “Shady Lady” and “Economy” by Wendy L. Starn. Shady Lady by Wendy L. Starn of LA. 26 3/4 x 27 3/4 inches. 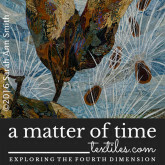 Included in Lark Book's 500 Art Quilts. Dogwood::Dawn by Sarah Ann Smith. 33 x 27 inches. Previously on sale at Ducktrap Bay Trading Company in Camden, ME. Economy by Wendy L. Starn of Louisiana. 19 1/4 x 19 1/2 inches. 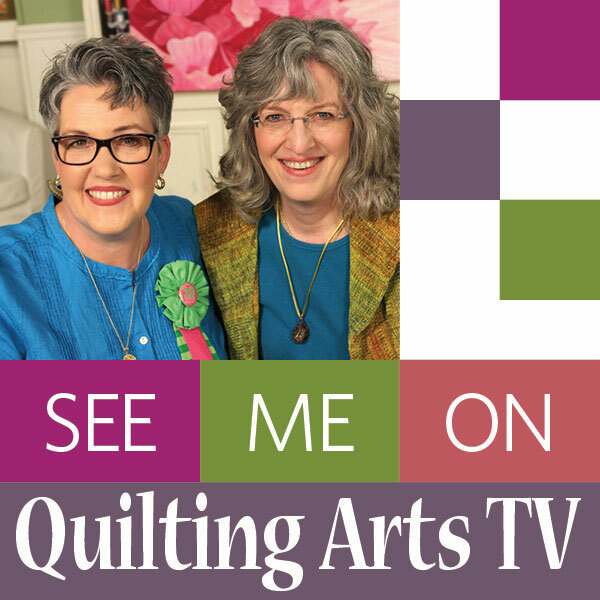 I have posted my information to the Lost Quilts website, and gone through everything Annie and I can think of to try to figure out what happened to the boxes. Annie remembers packing and labeling boxes with Wendy’s and my names and addresses, but due to a lot of pain from knee surgery, her memory isn’t clear about what happened with those two boxes. She thinks they might have been taken to the Office Depot, but there are no records. Without tracking numbers, the postal service can’t do a thing. I even suggested Annie check her bank records for purchases so we could do the math and it appears no postage was paid for the missing two boxes. I am still hoping they will turn up eventually. In the meantime, going public via the internet seems to offer our best hope for recovering these quilts. If by chance you see them (HORRORS) on Etsy or Ebay, or anywhere else, PLEASE let us know. As Annie is also having to move (while still in pain from the surgery) to a new home, please contact me. In turn I’ll share any info with Annie and Wendy. Annie is, I am certain, more stressed about this than I am! She has always been SO careful in the past, and I know that her pain was a major factor in this issue. Please send her healing light for her pain, and “good move” thoughts–and “come home quilt” thoughts for Wendy and me. I am still hoping that maybe they may be walkabout in the US postal service…perhaps with no postage and have yet to be returned to sender….. 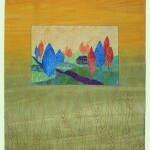 This entry was posted on Wednesday, November 16th, 2011 at 3:40 pm	and is filed under art quilting, Exhibiting. You can follow any responses to this entry through the RSS 2.0 feed. Both comments and pings are currently closed. Oh Sarah, you must be sick about this, and especially the award-winning quilt! I will certainly keep my eyes out for them, and say some prayers too! Eek. A curator’s and creator’s worst nightmare. Sending “come home quilts” thoughts into the universe. I know you all are heart broken! Perhaps a special letter to Office Depot with pictures as well as the postal service. There are caring people out there and may not even know what’s in the box. Also sounds as if maybe they were at Office Depot, but perhaps set aside to make room for the other boxes and then overlooked in assigning the postage. That leave them some where just sitting unopened. So maybe letters with pictures to customer service may help to connect you back together! Mean while, yes, make replacements and just as you finish, they are both likely to show up! Then you’ve got a series going! Not a good way to do a series, but you’ll end up with double the blessings. Sarah. I’m so sorry your quilts have been lost and do hope they come home dragging their tails behind them. I’ll concentrate on this little verse: “Dear St. Anthony, come around, something’s lost and can’t be found”. Hugs, Dorothy. Oh this is so heartbreaking, Sara. I’m just sick for you and Wendy. I’m sure sending my “Go Home Quilts” voodoo vibes out into the universe, and will surely keep my eyes open for any clues. Please let us know when they do show up. Such a very sorry thing to have happened — and I am sure that Annie feels miserable about this as well. Got the fingers and toes crossed and the prayer wheel spinning. 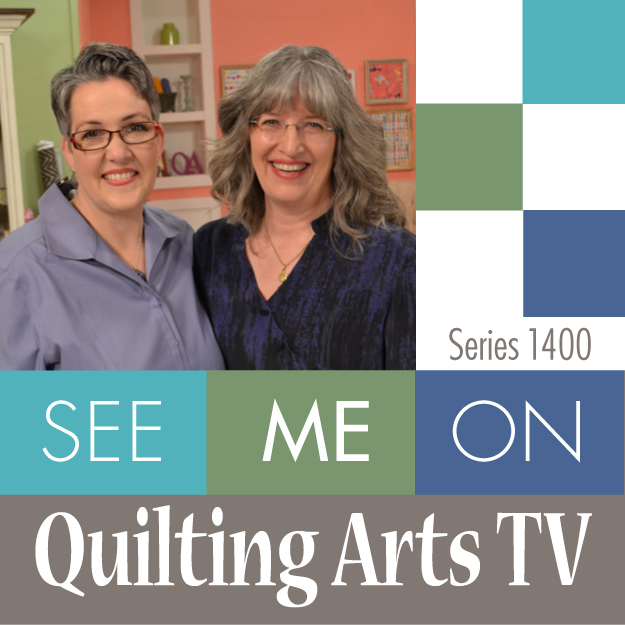 I am so sad for you, it’s every quilters nightmare. 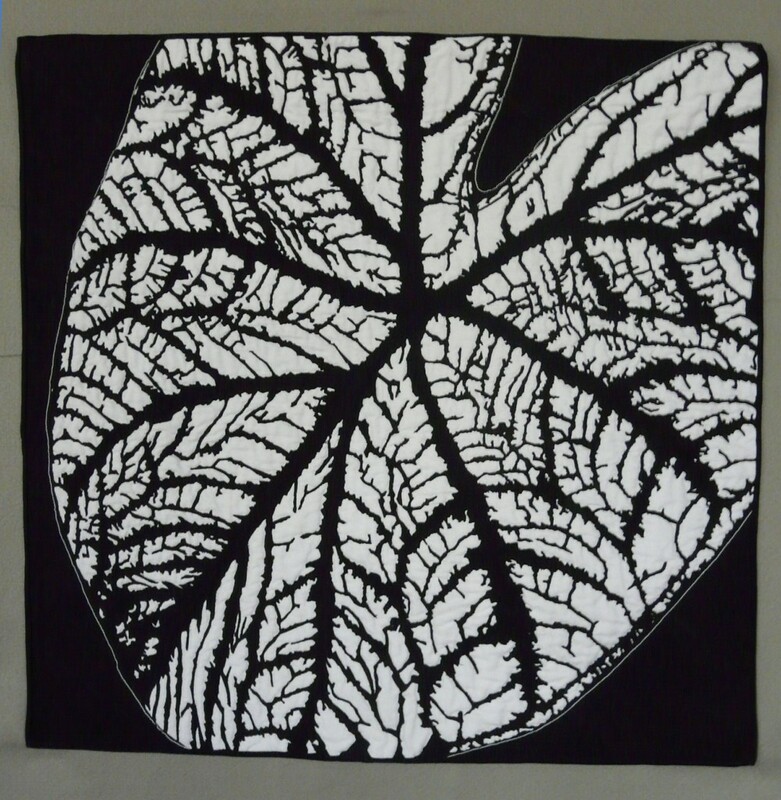 Your award winning quilt is very well known, hopefully it will turn up. How awful! Prayers to St. Anthony for the quilts! Oh, I am so sorry!! 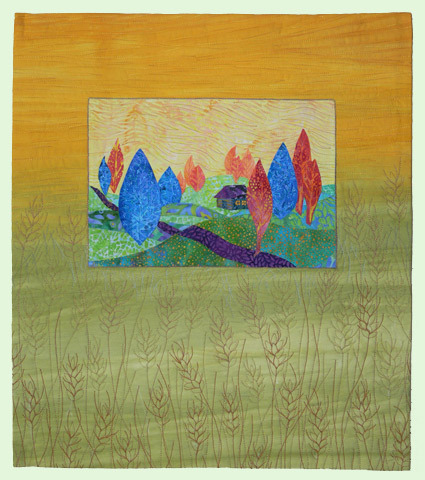 I saw Fields of Gold in person that year in Houston and it really was one of my favorite quilts!!! Knowing as I do the care that Annie takes of other’s quilts, she must be totally distraught about this. I am sorry for you and Wendy that you have quilts gone missing. Keeping good thoughts and I hope that the return to the rightful owners. This is the worst scene scenario that all of us fear. I am SO sorry SB, that this has happened. Sarah, I’m so very to hear about your lost quilts. Seems like just yesterday we were sitting there together in Houston waiting to see which awards our mini’s won. I now have a missing quilt too. 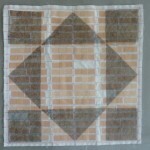 My 1st place quilt this year went missing the day after the show closed. I pray we both get them back.